Rudolf G. Wunderlich passed away peacefully on September 22, 2004 in Fountain Valley, California after a long illness. Born in Tarrytown, NY in 1920, Rudy graduated from Hackley School in Tarrytown, and then proceeded into the family art business. As president of Kennedy Galleries, which was founded by his grandfather Hermann Wunderlich in 1874, Rudolf Wunderlich was a leading art dealer in American art for over 50 years. During the 1950’s he transformed Kennedy Galleries from a leading print gallery to the premier dealer in American art. He wrote and published the Kennedy Quarterly, and advised many of the foremost collectors of his day including Thomas Gilcrease, the Hochshield family, Jack Warner, Philip Anschutz, the Rockefeller family, Ross Perot and helped Jacqueline Kennedy as she set up the White House Collection. He was a leading authority on Western Americana – the art of Frederic Remington, Charles M. Russell and other artists who portrayed the early Western frontier. In this capacity he advised, and appraised virtually every major public and private collection in the field including the Amon Carter Museum, The Cowboy Hall of Fame, The Buffalo Bill Museum, The Sid Richardson Collection, and the R. W. Norton Museum. Other institutions in which he was instrumentally involved included the Adirondack Museum and the New York Historical Society, to name a few. He was best identified with the sculpture of Frederic Remington and became the leading expert on Remington bronzes, sorting out the reproductions and fakes from the original castings. 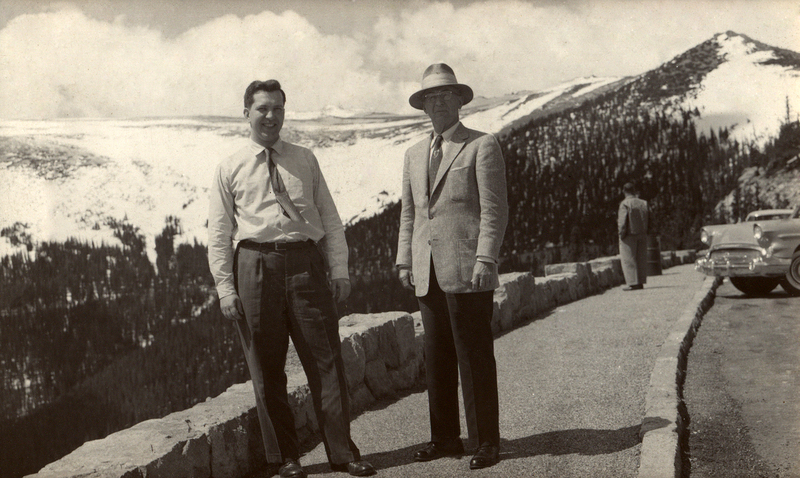 Thomas Gilcrease with Rudy Wunderlich in the mountains, Summer 1958. At Kennedy Galleries he established the reputations of Harry Jackson, the western sculptor, and launched the career of John Stobart, the leading marine painter in America. He was also an expert in nineteenth century American prints, twentieth century American fine prints – from Whistler to Hopper, and continued the family tradition of dealing in Old Master prints. He was an original member of the Art Dealers Assoc. of America, one of the inaugural exhibitors at the Winter Antiques Show, and was on the original Art Advisory Panel of the IRS. In 1985, he moved to Chicago and became president of Mongerson-Wunderlich Galleries until his retirement in 1998. On a more personal level, Rudy Wunderlich was a collector of nineteenth century American stamps, and formed one of the foremost collections of proofs, essays. His collections were exhibited widely, and won numerous prizes, including gold awards at Sipex (1966), Interphil (1976), Capex (1979), Tokyo (1981) and the Grand Award at Aripex (1982). He served on the board of the Philatelic Foundation. His wife, Susan, and his sister Roberta Chamberlain survive him. His children, Gerold, Theodore and John, his stepchildren, Tyler Mongerson, Tina Smith, and Lindsey Jackson, nine grandchildren, and two great grandchildren also survive him.